Compression moulding is a traditional technique that uses a combination of heat and pressure to mould thermoset rubber, or plastic resin or into the customer’s desired shape. The rubber or resin material is shaped using a heated mould tool and the clamping pressure of a press to force the flow of that material around inside the tool. The thermoset characteristic of the material is instigated by this process, and permanent chemical change takes place, fixing the shape of the product. Once this cure, or vulcanisation, process is complete, the mould is opened and the part extracted and allowed to cool, maintaining the shape of the mould that produced it, although the part may shrink during cooling to arrive at its final size.. The technique can be used to make a wide range of products such as wellington boots, machinery parts, seals, gaskets or even door stops and chair feet. This manufacturing process is very capable of reproducing the same product a large number of times, but it is not necessarily suitable for everything. Here are some of the advantages and disadvantages that relate to compression moulding as a process, to help you decide if it’s right for you and your product. Lower cost Tooling Because the process does not involve an Injection or Transfer cycle, the tooling has less infrastructure requirements than tools designed for other moulding methods; other than the particular features of the cavity itself that will produce the moulded parts, which clearly have to replicate the detail of the product, there is little else needed in the way of additional features. Tools can be made of aluminium or lower cost grades of steel which can save cost, although any tool must be capable of withstanding the considerable moulding pressures required. Good for small production runs The lower capital cost of manufacturing a mould tool, setting up a press and beginning to run production parts means that compression moulding is the most cost effective method of making smaller runs of parts. There is of course a breakeven point where the higher capital cost of an injection mould tool becomes viable due to the lower cost of the parts it makes, and making the correct determination of this point is a key consideration when developing the best production solution for a new product. No gates, sprues or runners This form of moulding does not use gates, sprues or runners which are tooling features that materials have to pass through in other methods of production before entering the mould cavity. These consume extra material and therefore cost, and can also detract from the cosmetic requirements of a part, both of which can be considerations when deciding the most appropriate tooling method for production. Good for large parts This form of moulding is particularly suited to the production of large parts, which require significant bulk of material to manufacture. Because the material is loaded into the mould cavity directly, there is no limitation on the weight of part that can be made other than the size of press and tonnage required, whereas injection moulding presses are limited in the weight of part they can produce by the volume of the injection barrel that fills the mould. Greater waste Compression moulding is not such a precise method of making a product as injection moulding because the mould cavity has to be overfilled to some degree to achieve the correct pressure to cure the part. It is also often necessary to push air out of the cavity using excess material in order to create a void-free part, which again increases wastage whereas an injection mould is more precisely filled and inherently drives out the air as it is filled. Waste thermoset rubber or plastic cannot be melted down and reused so the cost of the part must reflect this. Higher labour cost This production technique is essentially simple, but it does require more man power than a semi automatic injection moulding process to run. 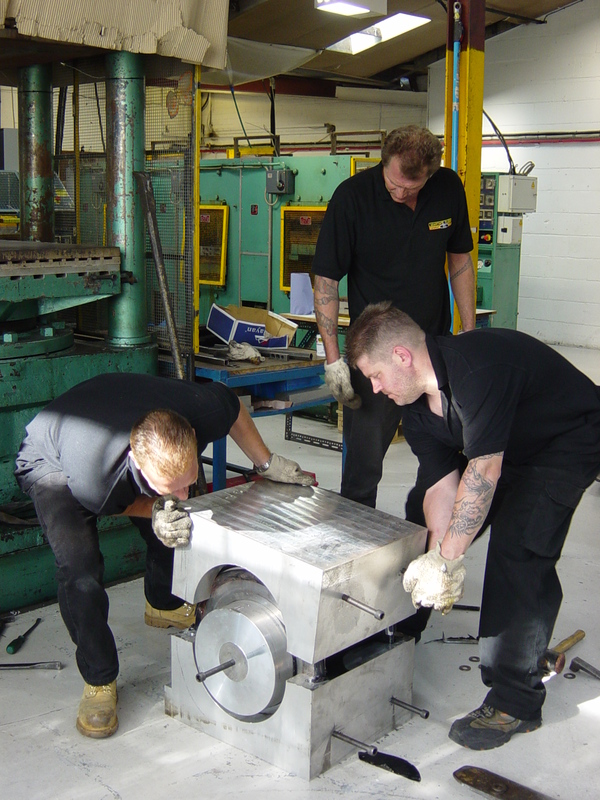 The skill level is often proportionately higher, and for larger parts or tools, manual handling can become an issue. Slower process times Because the thermal conductivity of rubber and resin is relatively poor, bringing a blank of material up to curing temperature by contact with the hot surfaces of the mould does take time for larger parts, and this limits the speed at which parts can be cured and de-moulded. Injection moulding, however, shoots material into the mould that is already at a temperature just below curing, and so the extra time required to begin cure once the press closes is much shorter. Depending on the size of a part, a typical cycle may take around ten minutes, whereas the equivalent cycle of injection moulding would take about five minutes. This can make a significant difference when producing parts in higher volume, when production rate and part cost become the priority. Not suitable for complex moulds While complex parts can be made by compression moulding, depending on the material required and the specifics of the design, it is generally better suited to the production of larger, simpler objects. This is because the limited flow of material within the cavity often makes the elimination of voids, air traps and knit lines difficult when trying to produce complex parts. Contamination It is much easier to produce clean, consistently coloured rubber parts by injection or transfer moulding, as the uncured blank of compound used in compression moulding can pick up specks of dirt which then simply get pressed and cured into the surface of the part, and result in poor cosmetic appearance despite the part being dimensionally and physically acceptable. This increases reject rates and waste. Difficult to control flash Flash is a necessary by-product of compression moulding due to the need to expel air during the moulding process by overfilling the mould cavity. This flash can also vary in thickness depending on the exact fill of each particular shot, leading to issues with variable dimensions of the part over the split line (see our tolerance guide, relating to BS3734). The flash must be mechanically cut off and again is a thermoset material that cannot be recycled easily, and the resulting split line witness mark is often more evident than on an injection moulded part which may be an aesthetic problem to the customer. Generally, compression moulded parts require more labour effort to trim and finish them, which also increases the cost. Moulds can be damaged The repetitive nature of this process means that the moulds themselves can become victims of general wear and tear, with manually loaded blanks of material and, often, the mould is made to be run loose and not bolted into a press. This can lead to deterioration of trim grooves and fine details, or in extreme cases, impact damage on mould faces caused by poor handling. Overall, the process of compression moulding is ideal when used appropriately and can help to keep overall project costs to a minimum, although individual part costs will be higher compared to other techniques. It is vital to consider all the required aspects of a product, its performance and its life cycle when designing the most appropriate production solution, as each process technique has a different combination of costs and benefits. The proper solution may not require an expensive injection mould tool, and thus even if the part cost is higher, overall, compression moulded solutions remain as relevant as ever. See our blogs on rubber shrinkage, rubber hardness and our Moulding Expertise webpage for more info. The post Advantages and Disadvantages of Compression Moulding appeared first on Martin’s Rubber Company. Green Rubber – does recycled rubber have a future?